After a fulfilling career in life raft surveying I moved into the catering trade. It is here that I gained an insight into the world of Toastmastering. Now as a result of being introduced to such a fulfilling career I have the immense pleasure of hosting in some of the most important occasions in people’s lives. It truly is an honour to be invited to be a part of such momentous events as weddings, ladies’ festivals, corporate dinners, awards ceremonies etc. Located in Medway and conveniently situated to serve the Kent, London and South East areas of the UK. 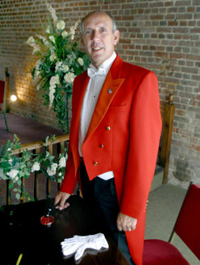 I have been serving the Toastmaster circuit since 2003 and specialises in weddings and Masonic functions. As a graduate of the One to One School of Toastmasters let me take the stress and worry out of your wedding day. I will advise on procedure and protocol prior to the wedding and talk you through what to expect from your big day. Long before the day I can visit you to discuss the arrangements you require for your special day and advise on wedding days procedure as needed, thus ensuring the day runs smoothly with professional care and custom, taking the pressure off all involved and allowing everybody to relax and joy the day to the full. Please feel free to browse around my site. You will find a list of services provided, helpful hints, portfolio photographs and useful links. Thank you for visiting. I hope you have found my site both useful and informative and I look forward to hearing from you.